How has the economy changed over the last generation, and what do today’s workers have to contend with that previous eras did not? Jim and Floyd Marinescu, CEO of C4Media, discuss these issues and more on this episode, which focuses on basic income from the business perspective. Owen: We’ve looked at basic income from a number of perspectives on this podcast, but one we haven’t actually delved into as much is the business perspective. Jim: Yes, there’s some interesting ways to look at basic income that doesn’t necessarily come up if you’re focusing on it solely from more of a moral or pragmatic social program perspective. To delve a bit more into this, I sat down with Floyd Marinescu. He is the founder and CEO of C4Media and has been quite a longtime advocate for basic income specifically from that business perspective. Owen: Here is Jim’s conversation with Floyd Marinescu on the Basic Income Podcast. Jim: Well, Floyd, thanks for joining me on the program. Jim: To begin, can you just tell me, how did you first get interested in basic income? Floyd: I can’t remember what the first trigger was, but I just know that when I first heard about it, I heard that there’s a way that you can solve poverty and also grow the economy, I’m like, “This is great.” I particularly became interested in it because being involved in software development, I can see what’s coming down the line with artificial intelligence and machine learning. I also have a personal story along about globalization with my father and uncle. They lost their jobs in manufacturing in Ontario where Toronto is when China entered the global trade market in the 2000s. They could never have seen that coming. They had no idea. I remember one time I was at a barbecue with them when I was 17 wondering what I should do with my career, and they were like, “You should go into tool and die manufacturing because we’ll always need more metal parts.” I chose computer science. Five years later, both of them are out of work because the industry contracted significantly. I think I became really worried because I see the same dynamic playing out now, both in terms of globalization and automation, and that’s what really got me more urgently interested in basic income. Jim: It’s interesting, and I feel like typically when you talk about any sort of social program, advocates tend to have a personal story that reflects, “Oh, I had this particular challenge growing up. We didn’t have enough money for food. We were dealing with some sort of housing crisis,” and that’s a motivator here. It’s interesting, it seems like in the basic income is space you actually have people who are engaged in some of this technology work, and that is really the personal story. It’s seeing how either of themselves or someone they know well that the changing nature of work has already affected them. Floyd: Well, there is that personal story for me as well. We grew up pretty poor and working class, and money was always a source of tension, sometimes even toxicity in arguments. I wish there was a basic income so that there had been more equality in my family and there would have been less tension. I personally can feel the fact that it seems like the economy is sliding in the wrong direction for more than half the population and their children will be going through what I went through. That’s definitely at an energy level something that drives me in this for sure. Jim: Yes, so you’re getting both perspectives there really. I’m curious, again on a similar note, when most people advocate for basic income, generally they are either talking about, “Oh, we need to like look at this from like a social perspective”, lifting people up, or perhaps the more pragmatic humanitarian perspective, that this is a more efficient way of supporting people. But your argument is really on the business side. You see this as something that is actually going to help businesses. What are your main arguments on that? Floyd: Well, there are arguments that are timeless, and I’ll go over those, and then there are arguments as to why it’s urgent. Maybe the urgent ones first although I’m sure your audience has already heard this before. I actually think that we’re in the middle of a multi-decade labor market correction. I use the term metaphorically, but I think it probably applies. A market correction that’s keeping wages– depressing wages effectively and reducing the number of middle-class jobs available to everyone in western countries. I call it a correction because if you look at those graphs of money going to wages versus productivity, and you’ve seen how since the late 1970s, they used to go hand in hand together. People were getting raises every year as productivity was increasing then it stopped. Now for 40 years, a majority of working people haven’t actually had a raise in inflation-adjusted terms, and many are actually making less than they used to make. To me, that’s a market correction and the cause of that market correction is automation probably primarily. We already have 40 years of automation that people don’t think about. There’s a lot of hype about AI, artificial intelligence taking out jobs. But the automation we already have, all the industrial robots that we already have, the software gains we already have. I was talking to the General Manager of the Marriott Marquis in New York Times Square where we host a major event every year, and he told me that that hotel used to have 2500 people running it in the ’80s and now it needs only 1500. And that’s a hotel, it’s a fixed asset. Not many moving parts. My father told me that a lot of the manufacturing companies in Ontario that survived the competition with China only survived because they automated. If you go visit those plants now, you see industrial robots everywhere and far fewer people. The problem is that the globalization of today is not my father’s globalization. No manufacturers are still losing jobs to China to my knowledge. Today’s globalization is about entry level even clerical work. I know 15 entrepreneurs that have virtual assistants in the Philippines because they cost three dollars an hour. Those are the jobs that are not being hired in their own hometown. Any graphic artist these days has to compete with people on Upwork from Eastern Europe and South America. Today’s young people are in a far, far more unfair advantage than our parents were, and no one is talking about this. This is really serious. I kind of mixed the automation and globalization messages there, but these two are the number one trends I think that for 40 years we can already see the impact it’s had on the economy with pretty much the lower 60% of society falling into a more precarious check by check existence. Even Ray Dalio, the billionaire hedge fund manager from Bridgewater Associates, released a report saying that from now on we need to consider that there are actually two economies here. There’s the economy of the bottom 60%, and the economy at the top 40%, which has done much better. The people in the bottom 60% economy have twice the suicide rate, can’t find $500 in case of an emergency, and are increasingly being structurally excluded from growth. He says that this is causing a decline, a slowing of economic growth. If you look back at that the productivity versus wages gap, it’s roughly a trillion dollars a year in the US that used to go to workers that now goes to shareholders and executives. You can just imagine that trillion dollars if it was still going to workers would have been a much, much bigger– we would have had a much bigger economy. Wages would have been much higher. These are the trends. A lot of people like to blame the demise of unions. Even Andrew Stern in his book — he was the president of the SEIU — he said one of the reasons he left the unions is because they couldn’t nationalize, and they also couldn’t go global. They’re structurally cannot cope with globalization or automation. I think it’s really globalization and automation. But today we also see the transition of work to part-time contracts, more gig economy work, which doesn’t have benefits and generally is a form of competitive labor marketplace, actually occurring in labor marketplaces where everyone’s competing with each other. Then the final trend I see that’s a big deal is this winner-takes-all economies now where companies like Amazon are absorbing huge shares of economic activity. Amazon will have 10 times the impact Walmart had on main street retail. I’ve heard projections that 30% of shopping malls will close within five years because of Amazon, and retail is the number one employer. These are the urgencies for basic income. I feel that it’s time that as a society we acknowledged that these structural changes are happening, and this makes left versus right views about welfare or laziness or all of those things completely obsolete and completely beside the point. Those views reflect a 1970s’ viewpoint when wages were rising with productivity and when families real purchasing power was, in fact, higher than it is today. I think we don’t need to wait to see if AI takes out half of all jobs, we can already see the impact on the economy. I was doing some research recently on the impacts here in Ontario, and I was actually amazed that since 1997, the number of people– the share of jobs, share of people in minimum wage jobs, not the number, but the share of them has increased fivefold. The number of people in low-income jobs has nearly doubled to 30% of all jobs according to some reports I’ve seen. This same trend is playing out in the US where you have the hollowing out of a lot of the second-tier cities in the middle of the country. People primarily moving to San Francisco, New York, London, and Boston. And so you can just extrapolate these numbers: what happens if the share of jobs that are low income grow to 60%, or as Nick Hanauer who I follow a lot of his work — he’s the guy who did the Beware, Plutocrats, The Pitchforks Are Coming — he points out that the top 1% only have 5% of national income in 1980, now they have 22% and the bottom 50% is where the loss was, their earnings. Imagine that if nothing gets done in 10 or 20 years, the top 1% have 35% of national income per year. Then you don’t have capitalism anymore, you have a feudalist economy. You just extrapolate the numbers, that’s where we’re going. In my opinion, basic income is the most scalable solution to that. The other arguments I have about why it’s pro business are fairly timeless, but they kind of segue off of that. Jim: I mean, you raised a really interesting point, which is oftentimes when we talk about automation, the conversation is what will happen — and whether it’s 5, 10, 20 years — with robots coming and taking our job. I think oftentimes people adopt this somewhat literal view of that. That either a robot itself or a computer program will just come and do your job. It still seems like, more so now, but there’s still limited imagination as far as, “Oh, could this actually happen?” So your point that you were making, which I think is an important one, is that we don’t need to look to the future, that automation has been happening here. I also was struck by your noting about the low-wage job increases because I feel like that’s often something that people raise as a counterpoint. That if automation is happening, why do people still have jobs? Why isn’t productivity going up? If people are being forced into these low-wage jobs to have something that would really explain why that trend hadn’t manifested in a way that they might have intuitively expected if you’re talking about the robot coming and taking a more specific job. Floyd: Exactly. The way the labor market changes with automation, it’s not that, as you said, it’s not that a robot comes and takes your job, knocks on your door. It’s more like over the years less people are needed to do this to do work as demand grows. Companies become more productive with less people. So GDP is up, population is higher, but less people are actually needed to do the work. Here’s an example I think we’re going to see playing out. Let’s say that artificial intelligence gains replace a lot of work that doctors used to do. This is 100% being discussed right now. There are startups coming out of the Valley that are working on these problems. I’m sure your readers have heard that software that does cancer scans and X-rays is now more effective than panels of radiologists. What you might have is, let’s say metaphorically, 10 doctors serving 1000 people but then 10 years later after new software gets adopted, a new hardware gets adopted, you still have those 10 doctors but now maybe you have maybe more like 50 technicians who are paid a quarter as much as a doctor just working with software and computers and carting them around to see their patients. It might have been a requirement to hire another 50 doctors as the population has grown, and you’ve replaced that 50 doctors with a thousand personal support workers who just work with software, who get paid something close to minimum wage or a bit higher. That’s how it’s happened. The hotel example is evidence of that and all the manufacturing cases. That’s how it happens, and that’s what AI is going to do. All the experts are saying that– I don’t think they’ll be no jobs, I just think the jobs will be– there’ll be more jobs that are low paying, and a lot people won’t want them. The only way to make those jobs actually work is if you have a basic income so people can choose to do that work while not living precariously and not living on a subsistence level. So I think basic income will make that work actually pay enough, in combination with basic income. That’s the future because it’s already happening. Jim: You’ve talked about some of the urgent and dire reasons that we need to be changing the system now. I think you alluded to earlier that there are some perhaps more positive rationales that business might be interested in supporting basic income. Can you talk through your thoughts on that? Floyd: I’m amazed no one talks about this. 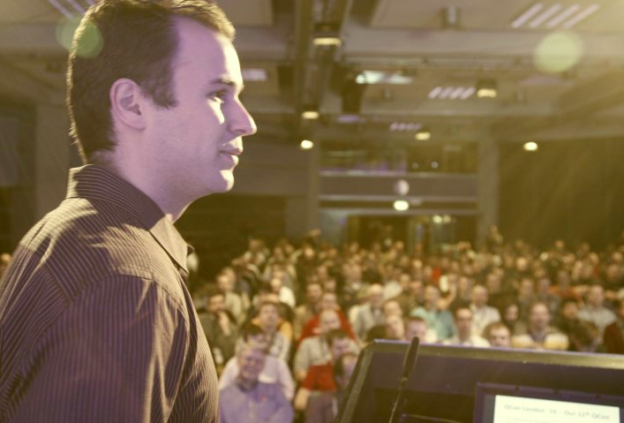 I’ve been running a business for 12 years, and we have over 7,000 software developers a year who come to my conferences in New York, San Francisco, London, China, and Brazil. We also have a news website for software engineers that has over a million readers a month. I’m very interested in the macroeconomic cases for these. I just looked into it a bit, and there’s some talking points that are just not there. The first one is that it is an economic stimulus. I mean business can only hire in response to increasing consumer demand or purchasing power. If we want to grow the economy, we have to make sure that enough people can participate in the economy and buy things so that new businesses and the vibrancy of new startups, all that can be maintained. Quite simply, there’s been research shown that programs that put more money in the hands of those who have the least generate five times more return to the economy than corporate tax cuts. The velocity of money in the US has been drastically affected since 2008. I think I saw Nick Hanauer put up a slide that the average dollar was exchanged 17 times in the year before 2008, and now it’s only exchanged five times in a year because wealth has been so concentrated in the hands of a few. Maybe it’s time that we engage in a demand-side stimulus like a basic income that directly brings people up to a livable level and stimulates the economy. There’s real evidence now that this would work. There’s a program in Canada called the Canada Child Benefit. It’s something that even some Republicans in the US were suggesting that we do something like that in the US, which is encouraging. The Canada Child Benefit is an unconditional, no-forms-to-sign cash transfer program for families. I think it ranges from a hundred dollars a month all the way to $530 a month per child per household depending on their income level. Imagine that a family in poor circumstances with two children could be receiving over a thousand dollars a month, no strings attached, from the government and which helps them make ends meet. This program not only has it brought– it was launched in July 2016– not only has it brought 300,000 children out of poverty according to Justin Trudeau, the Prime Minister, but the Governor of the Bank of Canada, Stephen Poloz, said on record that this program resulted in a 0.5% GDP growth in 2017. That’s pretty amazing. Half a percent of GDP growth. As you know, GDP measures the exchange of goods, production of goods. Obviously, if there’s more goods being exchanged, more jobs are created. I’ve noticed personally that when looking at unemployment graphs, the five-year graph of unemployment in Canada, the unemployment rate was pretty flat for three years. Literally the month after those payments began, you can start to see the lines starting to go down. Now we’ve had two years of non-stop decrease in unemployment. Now that’s happened in the US as well, so there might be something going on, but it’s unusual how those payments seem to correlate to dislodging a flatline in unemployment. So it is an economic stimulus. I’m sure your readers know the Roosevelt Institute in the US did a projection that the US economy would grow by at least 13% within a few years if there was a basic income, adding two and a half trillion dollars to the annual economy, creating over four and a half million jobs. It’s also would be a great stimulus for rural and small towns. Big cities is where taxable economic activity is concentrated. You can imagine that if there was a national basic income that it would effectively be like the big cities investing in the small towns because the basic income would be the same amount probably all over the country. That would make small towns more affordable, bring in fresh cash, result in a lot of investment. We’ve seen that the rural town of Dauphin in Manitoba in Canada, when they had a five-year trial in the ’70s, we can see a lot of evidence, a lot of stories about people buying tractors and farming implements, just taking themselves one step up in their lives and spending more in the economy. In addition to social benefit outcomes like hospitalization visits went down 8.5%. So it’s an economic stimulus. Another point is that it’ll help us manage recessions. The biggest problem during a recession is consumer confidence. In that regard, basic income is an automatic stabilizer. If people aren’t afraid of what they’re going to eat tomorrow, they’re probably not going to curb their spending as much. That’s something that I never heard anyone talk about, but it seems like such common sense. Especially when you’re talking about how a basic income would meaningfully reduce fear and anxiety for at least half the country. The other half, they have more money, they won’t have that much fear. But I have to say even myself, running a business, doing well financially, I worry that one day I could lose everything. Just knowing that the check is coming in every month is like an antidepressant. Actually, Evelyn Forget who did the analysis of the Dauphin, Manitoba experiment has this great article about how UBI would be massive for mental health because it functions as an antidepressant because people won’t be stressed. I know that from my own personal example because in my mid-20s, I took my life savings at the time I had. I made some money from stock options in a startup I was in, and I down paid a rental property. The income from that rental property massively reduced my sense of stress and anxiety. I knew that no matter what, I’ll never have to starve or worry about shelter. There will be just enough money to get by even if it’s a small amount. With that confidence, I quit a high paying job and started my business, and now I employ 50 people. The basic income for me was very personal. I want everyone to have that lack of stress. You don’t have to be a millionaire to experience the absence of strain and stress. You just need $1,000 or $1,500 a month that you can rely on, and that’s all it might take. Imagine a fearless society where no one has to worry about that, where no one’s voting for populists who are promising them stuff because they’re already feeling a sense of well-being. That’s what’s on the line here, and that’s why I’m so excited about basic income. A few more points, but you want me to go through them all? Floyd: Another point is it will unleash entrepreneurship. This is why the famed Y Combinator, the president Sam Altman says that when he went through Y Combinator, it was like getting a basic income. He got $12,000 a year, interesting number there, which they used to eat and live. I think basic income will unleash entrepreneurship. Now, it’s not going to create entrepreneurs, I think entrepreneurship and that kind of risk-taking is an innate quality. Imagine all the potential entrepreneurs that are held back by life’s circumstances, afraid to take a risk, just trying to make ends meet for their families, who could then take risks and do this. It’s really about helping people have time and mindshare to create things. Imagine if people were always creating. That’s something we can get from this. For those who are not entrepreneurs but who want to better themselves, it would reduce the risk of retraining and relocating. We need a more educated workforce. First, let’s help people have the mindshare to think about the future and be able to take time to go and retrain. I’d rather people retrain themselves or go on Khan Academy or Udemy than some government retraining program where who knows what they’ll come up with. Let’s decentralize, let’s trust the free market, so that people can go and retrain themselves or be able to take a risk by relocating to where the jobs are. I’d imagine myself if I was in poor circumstances and I had to go across the country to find work, I might hesitate if I didn’t know what I would eat the week I got there. Basic income will really help lubricate the system so people can be more mobile. The final point is that a basic income could enable an entirely new economy to emerge. I call it the volunteering economy. What that means is, let’s say someone wants to voluntarily work for you for five dollars an hour because they believe in what you’re doing or your cause. Maybe it’s not even a business, maybe it’s some sort of community service. Or maybe it is a business and they want to work for you and maybe get a profit share or just help. Well, none of that is feasible right now. Imagine economies, a number of businesses, organizations, community groups that would exist if there was a basic income in place so people could voluntarily choose to work. Even if the amount they’re being paid isn’t necessarily, wouldn’t necessarily be a living wage by traditional measures. Imagine it, if they’re choosing to do it, then they’re not under any coercion. This is why, from a business perspective, basic income is better than minimum wage increases, and it’s also better than EITC or similar programs that exist in the UK or in Canada because those programs don’t compensate for caregiving or unpaid work like community service or entrepreneurship. To me, basic income is just a much better approach to solve those problems. Jim: For me, the thing that really resonates is, what could be unlocked around entrepreneurship? If you look at who’s currently able to start a business, the vast majority of people have some substantial means already, either personal wealth or family connections. They’re in a position where they can afford to take the risk. Because if you’re not sure if you put food on the table, how on earth are you going to actually go potentially months or even years without actually getting a profit from your new business idea? Seeing how many potential entrepreneurs out there could be unleashed with this, I would say that is definitely something, both honestly from a business and equity perspective, that I feel like is very compelling. I’m curious, you’ve been doing this advocacy work for a while now and talking to people in the business space. How are they reacting to this? Is it resonating with folks? Are there certain folks that seem to get in and others who don’t? What has the reaction been? Floyd: I find that it’s mostly positive, particularly for people who came from humble backgrounds. They know how hard it was, and they can imagine how much better they would have been if they would have had a basic income back from day one. I would say it’s probably 70% positive, but people have questions like how do you pay for it and such. The ones that were more negative usually are responding from ideology and concerns about disincentivizing work. Usually, those who are open-minded, if we talk about it enough, then they usually see that it doesn’t disincentive work. Although most of the people I speak to are more the younger generation of business owners, people under 45. I haven’t spoken to any Fortune 500 people that have more of an old industrial mindset. But mostly positive, I’m actually quite pleased. Jim: Has there been any big surprises for you in your advocacy here? Reactions that people have had, or the types of folks that have wanted to get most engaged? Floyd: Right now, what I’m mostly surprised by and disappointed by is the decision of the Doug Ford government in Ontario to cancel the Ontario trial. To me, it seems like a political move. My personal theory is that– they canceled it before any data was even gathered, so they had no reason to cancel it. I think that it was actually a political move because probably the trial would have generated a lot of positive press over the next two years until it ended, and all those good news stories might have been used against the party at the next election should they choose to not run and not even talk about basic income. It’s kind of unfortunate that in Canada we have the Progressive Conservative Party at the provincial level, which is supposed to be progressive, and it used to be progressive. It’s quite exciting that even in Canada even conservative parties are progressive. Unfortunately, that seems to be changing, and it’s just disappointing because I think basic income actually is a progressive conservative idea. It almost passed in the US under Nixon, passed in the house. There was a time when conservatives actually cared about solving poverty and had no issue with taxation, and now that seems to have changed. I think that’s actually what happened, and I’m very surprised. I’m trying to do whatever I can, like organize other CEOs together to sign a letter to the Ford government to urge him not to do this. The big surprise I’m seeing is that– I have a strange hobby. I like debating people on Facebook about basic income especially conservative people. I truly believe that this a conservative idea, and what I find is that people just don’t know those trends that I mentioned at the beginning of the interview. They don’t know what impact globalization and automation has had on their jobs. I believe that people are good, and if they understood that working people actually don’t have access to enough good paying jobs anymore, that they’d change their mind, but they don’t know that. Most people on the right who are against basic income on laziness or entitlement reasons, I think they just don’t know. They literally don’t know that the labor market is not what it was in 1970 when most people could get a pretty decent job fairly easily and paying really well. Now it’s just not the case. Jim: You brought up a good point there, which is this interesting intersection of appeal that basic income may have around — particularly if you’re looking at it from a business perspective — that you could potentially get some more conservative folks to be behind it. While at the same time you have folks on the left who see this as a potentially transformative idea in how it might include people in the economy. Something I’ve encountered in our work at Universal Income Project is that while you can make both of those arguments, when you try to bring folks together, it doesn’t always go terribly smoothly. There is a lot of distrust, particularly in this moment in the US, maybe it’s less so up in Canada. When you have people coming in for different reasons, different value-based or ideological reasons, it can be a challenge to form a larger coalition. I’m curious if that’s something you’ve thought about it? Is it something you’ve encountered in your work so far? Floyd: Yes, it’s definitely something I see. I haven’t encountered it because I haven’t done any actual political stuff yet. All my work has been in the grassroots and in my spare time since I’m still running my business. On that note, what I’m most excited about now is Andrew Yang’s campaign in the US to run for president. I think the one issue that could actually cut through left versus right is automation. The fact that automation is replacing jobs and the people get educated on the fact that automation has already been replacing jobs and the stuff we already talked about, then the urgency is there. When the urgency is there, we can cut through all those discussions. So that’s really important. That’s why also for myself, for discussions I have, I tend to start with these trends that are changing the economy and, unfortunately, use a bit of fear because people respond well to fear. Although personally, I’m much more excited about basic income for the kind of society we’ll have after we have it. Right now, we need to defend the middle class, and we need to defend our way of life, and I know of no better solution than basic income. Jim: I would say personally I have some mixed feelings around that just because there is– you do have that extreme, the fear side, and the potentially massively aspirational side, and can those actually work well together or do you put people in different camps? I mean it certainly seems like if we can get more people to be recognizing the need for change, then that does open up new doors. Floyd: That’s why I like what Andrew Yang is doing very much, I’m doing whatever I can to help him. I actually really like also his proposal that this be taxed through a new Value Added Tax. In Europe, the Value Added Tax is 20%. In Canada, it’s 5%, federally, it’s called the GST. In the US, there isn’t one. What I like about the Value Added Tax is that it doesn’t touch income tax, so no one has those knee-jerk reactions when they imagine losing more of their income. A Value Added Tax also promotes conservation. If you can do more with less in your business, you’ll pay less Value Added Tax, that’s how the tax works. As opposed to income tax, which actually penalizes if you’re very efficient because then you’ll make more income in your business and pay more income tax. Another thing is that all the experts are saying– all the futurists like Elon Musk and Ray Kurzweil, they’re all saying that productivity will increase exponentially with so many new technologies coming and prices will get very, very cheap. To me, a Value Added Tax harnesses productivity. It tracks to productivity much better than income does. If a value-added tax is in place, then those exponential productivity gains will be able to contribute to society and contribute to the purchasing power and the livelihoods of most of society, which is why I really like– Andrew Yang calls it a dividend. Why can’t capitalism pay a dividend? What’s the point if it can’t at least pay dividends to keep people solvents at some basic level and maintain sustainability? Maintain renewability. We use that word renewables in the context of the environment, but the economy is a system as well. It’s a complex adaptive system according to new economists, and it’s not renewable right now because it’s trending towards feudalism now. If we had a Freedom Dividend, as Andrew Yang calls it, paid for by productivity to me it seems like a very logical way to harness exponential technological growth to make capitalism renewable and sustainable. Jim: Taking the winner-take-all direction we’re and actually creating a collective component to success basically? Floyd: Yes, harnessing it, harnessing it. If Amazon is going to be the sole shopping place for the whole country, they should pay based on a Value Added Tax. There’s another trend I didn’t mention is that these days, some of these large companies, the financial incentives are no longer profit, they’re share growth—they’re valuation growth in their shares. The whole venture capital movement now is much more interested in growth in share value than interested in profit. Our current taxation system that our civilization is based on is based on primarily profit taxing because capital gains is laughably low, as even Warren Buffet says, “It needs to be increased to a minimum of 30%.” When these companies are becoming the global winners, eating up the whole market in this winner-takes-all manner like Amazon, and they’re not actually making a profit, then the system is broken. The Value Added Tax would correct for that. Owen: That that was Floyd Marinescu, founder and CEO of C4Media, on the Basic Income Podcast. Jim: Floyd definitely had a different set of arguments than you typically hear when talking about basic income. I feel like the urgent ones that he described, those tend to align more closely with the conversations that often come up particularly around the forward-looking risk of automation that we think may be coming down the road and also how that’s affecting us today. As far as more specific economic ones, we’ve talked about that a little bit, but it’s certainly– even some of the same analyses when you’re thinking about what impact that has from the viewpoint of the business leader, it takes on a new form it seems like. Owen: Yes, I feel like this is an underplayed argument in the basic income space, and I certainly include myself in that as well, just because this is a direct way that people would be helped and the economy would be helped. It’s something that people respond to very directly. When you make a moral case, sometimes it doesn’t connect with people in the same way as opposed to something that would just make their lives better on a daily weekly basis. Jim: I think that’s true. I do think, and we’ve certainly talked a lot about this in the past, that when people talk about basic income as a bipartisan issue, I think warning lights go off for me. Because I think if they’re saying this is left-right, and you have some folks who want to lift everyone up and the folks who want to– really their main goal is cutting their social safety net, I think that even though both may support “universal basic income”, we’re going to end up with some very clear misalignment once we get to a certain stage in the process. But if you’re talking about forward-looking business leaders who are supporting a policy that ensures everyone participates in the economy, I don’t know, maybe there actually is an unusual coalition that could come out of that with those folks interacting and those people advocating for actually the same policy. Owen: I think the idea that there are people with great business ideas and who have things to contribute, but they need to make their rent in the next two weeks or else they’re screwed. I think that that can connect to a lot of people. I also, on a different note, liked how much emphasis he put on globalization because we’ve kind of baked that in in our thinking about the economy. It’s something that people don’t talk about too much, but it’s a major reason why people are as economically insecure as they are at least in the United States right now. Even if automation does not turn out to be as big a factor as people think it will be, we already have this major factor of globalization which could get even stronger as more and more of the world comes online and we’re able to do more and more remotely. Jim: I think if you zoom out far enough, one could argue that globalization is actually a specific manifestation of automation. We wouldn’t have globalization without the technology to actually be managing those communications, those operations around the world. So that, while it’s not the kind of micro automation of something coming and disrupting a particular job, it is another instance of technology disrupting the traditional model of work, and that it’s clearly something that has been happening for decades. One other thing I’ll add is, I do think that getting back to who is in this space, who is actually working on policy, something that is key that has struck me in multiple points in my work on basic income is still making sure that the people actually designing the policy are the ones directly affected. I think that there’s fantastic potential for business playing a leading role in pushing forward policy, but at the same time making sure that what the actual policy is, is being figured out by those who are in poverty, by those who are dealing with the racial injustice of our current system. So that what we end up with is something that is going to lift those people and not unintentionally leave folks out as has happened often times in the past. Owen: Alright, that will do it for this episode of the Basic Income Podcast. Thank you to our producer, Erick Davidson. Please subscribe on Apple Podcasts or the service of your choice. We’ll see you next week. This entry was posted in and tagged basic income, basic income podcast, business, economics, economics podcast, economy, podcast on August 16, 2018 by owenpoindexter@gmail.com.